If you have an old UPS system and by this we mean one that is more than 8 to 10 years old, then now could be the right time to consider a Power Trade-UPS with EcoPowerSupplies. UPS manufactures, like most data centre and IT technology suppliers over the last ten years, have invested heavily in miniaturization and energy efficiency. Today uninterruptible power supplies are smaller, lighter and less wasteful of electrical energy. Whilst a traditional UPS may have operated at 88% operating efficiency on on-line mode, today’s systems can achieve greater than 95% efficiency. Furthermore, when considering larger single phase or three phase UPS systems that have traditionally been transformer-based, advances in UPS power electronics has led to the more widely accepted adoption of transformerless UPS systems. These have more compact footprints and higher operating efficiencies of 96.5% or greater and over a wider load profile range (down to as low as 25%). Advances have also been made in battery charging and management technologies. Whilst a typical 5 year design life battery may require replacement at years 3-4 or a 10 year at years 7-8, modern UPS systems can now help to extend battery set lifetimes. Charging technologies are also more advanced, leading to energy usage reduction systems that allow a battery charge to enter a sleep-mode for up to two weeks or more whilst monitoring battery DV voltage levels. Improved monitoring systems and advances in algorithms have also help to improve overall battery lifetime management. Battery runtimes (and therefore battery pack size) may also be reduced thanks to advances in generator technologies and maintenance. Where a site may have insisted on a one-hour back-up time, they may not accept a 10minute one. This may also be in part down to the complexity of the data centre as most require several hours to power down or mirror to a DR site. They simply have to have a reliable generator as a battery pack covering 6-8hours or more would be financially or practically unviable. Advances in UPS technologies also mean that UPS maintenance may also be simpler leading to lower cost UPS maintenance contracts. Warranty periods are also longer and tend to now polarize around 2-3 years. The larger the UPS system, the more attractive a trade-in financial proposal may be. The older the UPS, the quicker the payback period will be. 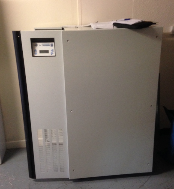 At EcoPowerSupplies we have developed a number of processes and services to help our clients upgrade their UPS systems. We provide a complete Trade-UPS service. This is a complete project management service including NICEIC installation of the new system as well as eco-friendly and legislation compliant removal and disposal of existing systems, with rebates for reclaimed materials. If you are interested in our Trade-UPS program and would like further details or a free site survey please do call us on 0800 210 0088.